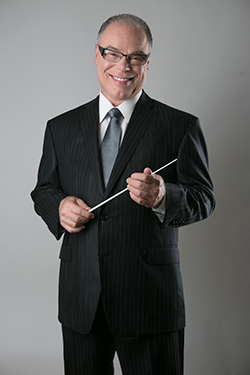 GRAMMY Award winner Jeff Tyzik is one of America's most innovative and sought after pops conductors. Tyzik is recognized for his brilliant arrangements, original programming and engaging rapport with audiences of all ages. Tyzik holds The Dot and Paul Mason Principal Pops Conductor's Podium at the Dallas Symphony Orchestra and also serves as Principal Pops Conductor of the Seattle Symphony, the Detroit Symphony, the Oregon Symphony and The Florida Orchestra. This season, Tyzik will celebrate his 22nd season as Principal Pops Conductor of the Rochester Philharmonic Orchestra. Frequently invited as a guest conductor, Tyzik has appeared with over fifty orchestras including the Boston Pops, Cincinnati Pops, Milwaukee Symphony, Pittsburgh Symphony, Toronto Symphony, Indianapolis Symphony, Philadelphia Orchestra, Los Angeles Philharmonic, Orchestre Philharmonique de Monte Carlo, Malaysian Philharmonic Orchestra and the Royal Scottish National Orchestra.In May 2007, the Harmonia Mundi label released a recording of works by Gershwin with Tyzik conducting the RPO and acclaimed pianist Jon Nakamatsu. This recording stayed in the Top 10 on the Billboard classical chart for over three months. Alex Ross of The New Yorker, called it "one of the snappiest Gershwin discs in years." "His concert is the kind of thing that's likely to give classical music a good name, perhaps even make it seem, dare I say, relevant," writes John Pitcher of the Gannet News Service. Tyzik worked closely with Doc Severinsen on many projects including orchestrating many of the great band leader's symphony orchestra programs. He produced a GRAMMY Award winning album, The Tonight Show Band with Doc Severinsen, Vol. 1. Tyzik's subsequent recordings with Severinsen garnered three more GRAMMY nominations. In his twenty-two years with the Rochester Philharmonic Orchestra, Tyzik has written over 200 arrangements, orchestrations and compositions for orchestra. A consummate musician, Tyzik regularly appears as a guest conductor in the orchestra's classical subscription series. He has also been commissioned to compose original works for orchestra, including a Trombone Concerto, which was funded by a grant from the National Endowment of the Arts and subsequently performed at Carnegie Hall. Tyzik conducted the world premiere of his original work New York Cityscapes with the Royal Scottish National Orchestra in 2010. Tyzik composed a Timpani Concerto, commissioned by the RPO, and also led the RPO in the premiere of his new orchestral suite, "Images: Musical Impressions of an Art Gallery" to rave reviews. In the 2015/16 season, Tyzik will premiere his new work "Jazz Concerto for Violin and Orchestra" on his Philharmonic Series performance with the Rochester Philharmonic Orchestra. A native of Hyde Park, New York, Tyzik began his life in music when he first picked up a cornet at age nine. He studied both classical and jazz throughout high school and went on to earn both his Bachelor's and Master's degrees from the Eastman School of Music. While there, he studied composition/arranging with Radio City Music Hall's Ray Wright and jazz studies with Chuck Mangione. Tyzik subsequently toured with Mangione as lead trumpet and worked on five Mangione recordings as a producer and performer from 1976 to 1981. Committed to performing music of all genres, Tyzik has collaborated with such diverse artists as Chris Botti, Matthew Morrison, Wynonna Judd, Tony Bennett, Art Garfunkel, Dawn Upshaw, Marilyn Horne, Arturo Sandoval, The Chieftains, Mark O'Connor, Doc Severinsen and John Pizzarelli. Tyzik has created numerous original programs that include the greatest music from jazz, classical, Motown, Broadway, film, dance, Latin and swing. For more information about Jeff Tyzik, please visit www.jefftyzik.com.